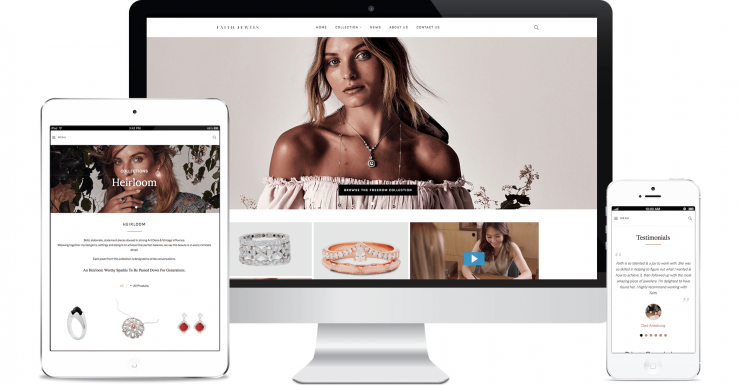 For this custom Wordpress and e-commerce project, the WDM team was tasked with redesigning an old website. For over 15 years, Faith Hilda has created bespoke jewelry designs. From a single ring to a major suite of jewels, Faith personally designs each piece, starting with a technical design sketch drawn to exact scale, which is then hand-crafted under her direction using traditional techniques. Faith wanted the website to not only project professionalism and build up her personal brand, but also to tell her story and the stories of her pieces. We delivered the website within a short timeframe and Faith was delighted with the final outcome. While it showcases her products in a catalogue format, the website also invites users to experience Faith’s process, inspirations, new collections, and beautifully designed commission pieces.